Cheerleading is a team sport designed for girls and boys in PreK or Kindergarten through 8th grade. To be able to participate, the child needs to be at least 4 years old. There is no experience required and no tryouts to make a squad. All that is required is enthusiasm, spirit, and regular practice to master moves, words, and build on teamwork. Cheerleading offers young children a chance to refine skills involving stunting and dance – possibly to pursue high school cheerleading. Squads are organized to ensure team compatibility and safety. Cheerleading is an athletic sport, involving strength for stunting, and stamina while you cheer and dance. The cheerleaders get the teams fired up with personalized cheers, signs and banners, tunnels at the end of games and special crowd chants. One of the key goals is to unite the cheerleading and football volunteers, and for all the children involved, to have an experience they will never forget! Practices are generally Wednesday evenings from 6:15-7:45’ish at a local elementary school gym. Games are EVERY Saturday morning or early afternoon at a local field. Welcome to ABGC Youth Cheer! I am delighted to have you as a part of my squad. My name is Joy Lynch and I am the Cheer Commissioner. 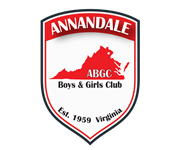 I’ve been affiliated with Annandale Boys & Girls Club for over 15 years. I served as Team Mom, the first year, Assistant Coach for one year, Head Coach for two years, and Coordinator/Commissioner for the ten years (with a year or two off). I am a native of Annandale, an alumnus of Annandale High School...Go Atoms! I began the program by enrolling my then 6 year old daughter into the program. She served on the cheer squad at AHS for 3 years. Her first year on Jr. Varsity and her last two on the Varsity cheerleading squad. Now, ABGC Head Coach Kayee is also the AHS JV Assistant Cheer Coach, AHS Freshman Cheer Coach, and AHS Code Red Dance team Head Coach. I have a son who has played football for ABGC Bulldogs, BRYC, RFFL, was a starting Running Back for the Annandale Atoms, and now plays for a private WV university. Last but not least, my youngest son is five years old and enjoys being on the field or off the field at the football games watching his siblings. We are looking forward to yet another rewarding season!! !